Successive droughts and erratic rainfall have led to excess extraction of groundwater. That explains 61 per cent decline in groundwater level in wells in India between 2007 and 2017. Now that the summer is upon us and the IMD forecast suggesting 44 per cent probability of below-normal monsoon this year, groundwater situation is likely to aggravate further. The national capital is the third highest groundwater exploited state in India. According to a study published in International Journal of Advance and Innovative Research in March 2018, 67 per cent of the residents (four million) in 1,797 unauthorised colonies in Delhi are drawing underground water. The majority of the unauthorised colonies are largely dependent on illegal bore-wells to meet their water requirement in absence of piped supply. Delhi is preceded by Rajasthan with nearly 66 per cent overexploitation rate. Punjab is the highest groundwater exploited state, where 76 per cent of the assessment units being overexploited. Moving to the west, Gujarat’s water table, especially in north and central parts of the state, has been dropping at a rate close to 20m per decade since 1974, according to a study conducted by the West Central Region office of Central Ground Water Board (CGWB). To control usage of groundwater, the state government is in the final stage of drafting a legislation on the basis of a model Bill provided by Central Government’s Water Resources Department. In Madhya Pradesh, water table is going down in larger area, but the recharge is happening in smaller areas, according to a CGWB report. Northern parts of the state, including Gwalior and Chambal region seem to have seen the worst decline in water table. A comparison with the last one decade revealed a rise in water level in about 37.44 per cent of wells and fall in 62.56 per cent of them. Moreover, even in cases of wells where water level increased, the rise was not significant. Maharashtra is equally struggling to maintain its groundwater level. 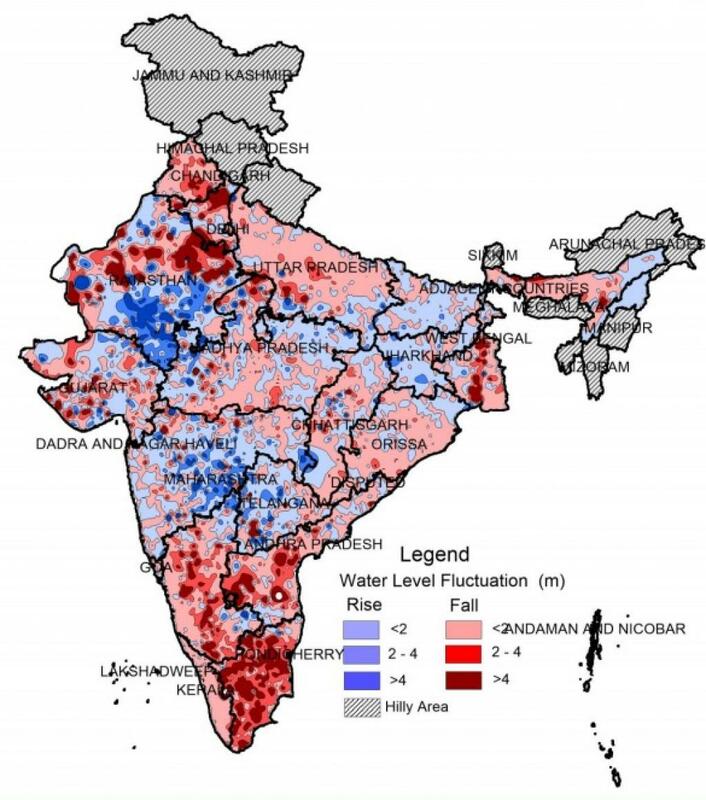 The CGWB’s report on fluctuation in groundwater in 34 districts shows that out of the total geographic area of 307,713 square kilometres, the groundwater level has fallen in around 150,000 sq km. In over 9,000 sq km, including parts of Yavatmal, Chandrapur, Amravati, Akola, Beed and others, the fall in groundwater level has been more than 4 metres. In the south, the groundwater level in Andhra Pradesh is showing signs of concern. According to the real-time data published by Andhra Pradesh State Groundwater Department, groundwater level in Prakasam, West Godavari and Ananthapur districts is at 19.89, 19.45 and 18.12 metres below ground level respectively. In Hyderabad, the level has plunged to an alarming level with West Marredpally and Tirumalagiri being the worst-affected localities. Karnataka has seen a drastic dip in groundwater levels with 985 out of 1,421 wells surveyed in the state showing a decline in water levels. 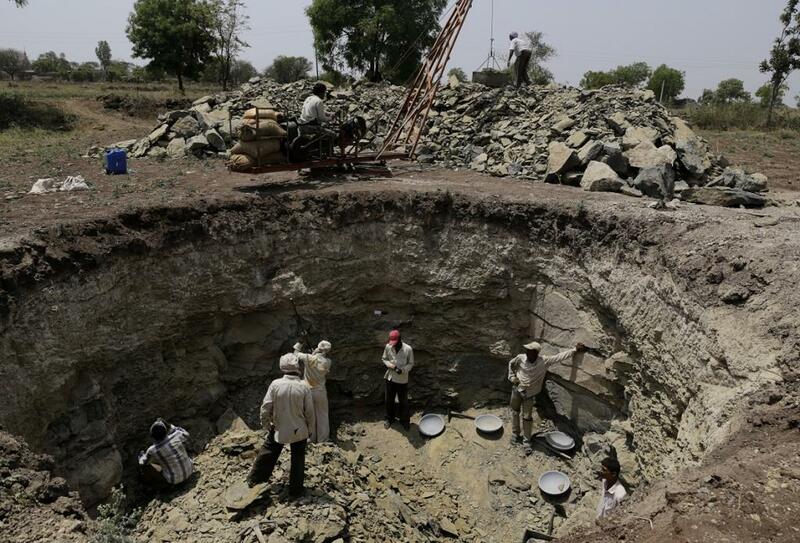 Farmers in the state are digging more and more borewells, but the sources of the problem are many, including transition to water-intensive crops and spate of construction activity along catchment areas. A recent DownToEarth story highlighted how Bengaluru is losing its capacity to recharge groundwater as the number of water bodies like lakes has reduced by 79 per cent. Tamil Nadu seems to be doing slightly better as compared to other states with observation wells in only three out of 31 districts registering a dip in groundwater level as on April 2018. Going by the data published in the Groundwater Year Book 2016-17, as of January 2017, Bikaner district of Rajasthan witnessed maximum drop in water level (122.10 metres bgl). In major parts of north-western states, the level of groundwater ranged from 10-40 m bgl. At a time when cities such as Bengaluru and Delhi are facing water shortage due to growing urbanisation, managing water resources is the key to create a water-secure future.